Republican Roy Moore, the homophobic bigot and former state Supreme Court justice running for Attorney General Jeff Sessions’ vacated Alabama Senate seat, has seen his campaign begin to crash and burn after the Washington Post produced well-evidenced allegations that decades ago, Moore molested teenagers. 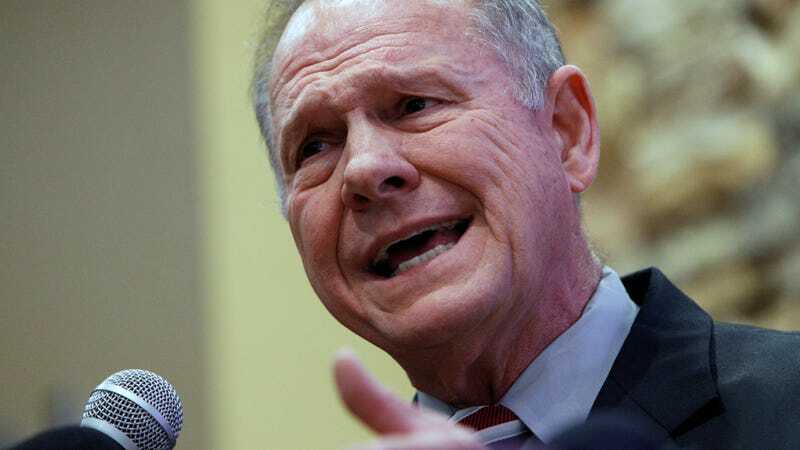 Moore has refused to end his campaign despite numerous calls from fellow Republicans to remove himself from the race, and the diminishing number of his defenders have turned to increasingly wacko theories that the child molestation are some kind of liberal plot. The dumb-as-hell claim, which had no evidence, briefly went viral. But after Washington Post reporter Dave Weigel and Task and Purpose editor Adam Weinstein challenged inconsistencies in the account’s military backstory—like whether he had earned 2, 3, or 4 Purple Hearts—@umpire43 registered for a tweet deletion service and cleared out their account on Monday. @umpire43's Twitter timeline now consists entirely of a few posts in which the user claimed his account had been “infiltrated,” because sure, whatever. As BuzzFeed noted, @umpire43's theory appeared to have nonetheless embedded itself into Moore’s side of the story. On Monday, the candidate threatened a lawsuit against the Post, and his wife Kayla Moore seemed to allude to the conspiracy theory in a Facebook post in which she wrote that “We are gathering evidence of money being paid to people who would come forward. Which is part of why we are filing suit!” As Gateway Pundit’s story continued to spread on Facebook, Moore’s official Senate page shared links to conservative sites promoting similar material. It’s true that baseless conspiracy theories have been a prominent feature of U.S. politics for decades. But social media certainly seems to have contributed to the potential reach of disinformation and the speed by which it reaches and potentially influences others, and numerous investigations are still ongoing into the scale and reach of alleged Russian efforts to spread propaganda on major sites like Twitter, Google and Facebook. This stupid stuff should never have spread in the first place, and it boggles the mind that a well-timed tweet aimed at the most gullible people in the country potentially affected the course of a major political contest. Yet here we are, unfortunately. Update 11/14/2017: Following the media attention, @umpire43 appears to have cut it with the half measures and simply deleted their account. However, numerous screenshots and archived versions of the account’s tweets remain online.